To provide superior aviation support through quality products and safe, efficient, professional and responsible operations! Welcome to the Hangar Flying Blog! We'll be posting news and updates frequently, so check back often! 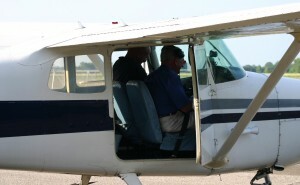 A typical lesson (prior to solo) involves approximately 1 hour of ground school going over the planned flight, flying for approximately 1 hour and approximately 1/2 hour ground discussing the flight and planning the next lesson. After soloing, the lessons will focus on cross-country planning and flying and the lessons will be longer (more ground school and longer flights).